1. In a stand mixer or in a large bowl with a spatula, whip the Real California cream cheese and butter together until fully incorporated. 2. Add the hot honey, cinnamon, nutmeg, lemon zest, and salt and pepper. Mix thoroughly, and turn onto a sheet of plastic wrap. 3. Refrigerate for 2 to 3 hours, or at least until the cream cheese mixture is firm to the touch. 4. While the cheese ball is chilling, toast the pumpkin seeds in a sauté pan, about 5 minutes. Remove the cheese ball from the refrigerator, and shape into a ball. 5. 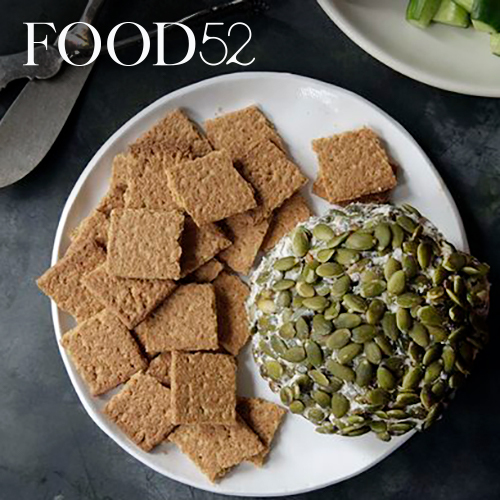 On a baking sheet, spread out the pumpkin seeds and roll the cheese ball in them so that it is fully covered. Serve with crackers.